Pyramid Lake on the in Nevada, a remnant of what was the enormous Lake Lahontan of prehistoric times, once held Lahontan cutthroat that grew to enormous size. The world record was a fish that weighed 41 pounds but there were rumors of fish that were as large as 100 pounds being caught in the commercial fishery that fed miners and others who lived in the area. The fish inhabited the entire Truckee River system from the alkaline Pyramid Lake to Lake Tahoe. The commercial fishery, invasive species, and a dam on the Truckee River were the thought to be the death blow to these mighty trout. In the intervening years, a smaller variety of Lahontan cutthroat trout from Summit Lake on the Summit Lake Paiute Tribal Reservation in northwest Nevada were established in the lake and became a popular fishery. These fish, however, did not reproduce on their own and were maintained by a hatchery program. The giant Pyramid Lake strain were thought to be extinct until someone stumbled upon a population of Lahontan cutthroat in a place they weren’t supposed to be. The fish were in the range of the Bonneville cutthroat trout in a stream on the border of Nevada and Utah that ran down Pilot Mountain. Someone had stocked them there before they went extinct in Pyramid Lake. Once it was discovered through genetic testing that these fish were the original inhabitants of Pyramid Lake, the USFWS began a program to reestablish them to Pyramid Lake. They were first stocked into the lake in 1995 but, for the first time in 76 years, biologists documented spawning by these giants in the Truckee River this spring. This shows that the reestablished fish are capable of sustaining their own population as long as there are good flows of water in the river. Jeff DeLong writes about this story in the Reno Gazette Journal Cutthroats spawn at Pyramid Lake. 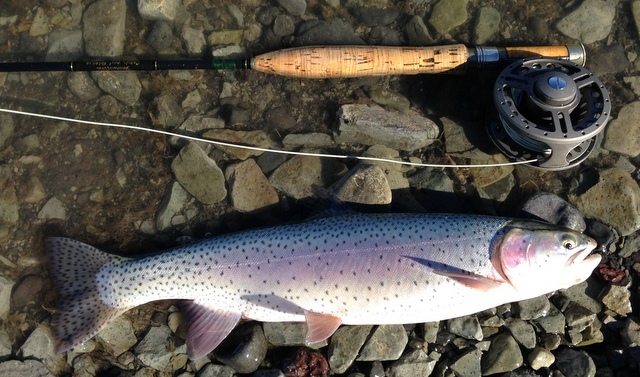 Overall, Lahontan cutthroat in the rest of their range are not faring too well due to abusive cattle grazing; introduced fish that compete with, eat, or hybridize with them; and dewatering of streams. They are listed as a threatened species under the Endangered Species Act. As The Wildlife News reported last year, another long lost cutthroat, the Alvord cutthroat, may be making a comeback too. There is little hope of finding the yellowfin cutthroat that once lived in the Twin Lakes of Colorado. They are likely gone forever. This is great news! Lets hope this continues! Incredible series of events, it’s awesome. I just learned Dr. Behnke passed away last year. I have fond memories of working on a project with him many years ago involving the historic range of the greenback cutthroat. He knew so much about the various subspecies of cutthroat around the West, and was always available to patiently share it.